(Nanowerk Spotlight) In recent years, polymer solar cells have drawn considerable research interest due to their attractive features including flexibility, semi-transparency, and manufacturability using cost-effective continuous printing processes (read more: "The state of nanoimprinted polymer organic solar cell technology"). However, one challenge limiting their commercialization is the relatively low power conversion efficiency when compared to inorganic solar cells. "One of the causes for polymer solar cells' low performance is the difficulty to simultaneously realize donor-acceptor phase separation within the short exciton diffusion length (∼10 nm) and high charge mobility, especially hole mobility, which are critical for charge separation and transport," Yi Yang, a senior engineer at Globalfoundries, tells Nanowerk. "So far it has been impossible to achieve such a morphology in the most widely used bulk heterojunction structure in which randomly distributed phases cause significant charge recombination." New work, led by Walter Hu, an Associate Professor of Electrical Engineering, and Anvar Zakhidov, a professor of physics, both at UT Dallas, shows that nanoimprint lithography (NIL) is an effective technique to solve these issues simultaneously. The results, recently published in ACS Applied Materials & Interfaces ("Efficient Low Bandgap Polymer Solar Cell with Ordered Heterojunction Defined by Nanoimprint Lithography"), show that low bandgap polymer solar cells with high efficiency of 5.5% can be fabricated using NIL. "Taking into account the fact that low bandgap polymers are becoming the main stream for this type of solar cell, we believe this technique will increasingly find more applications," says Yang. In a previous study ("How nanostructure geometry affects polymer photovoltaic device efficiency"), the researchers focused on nanoimprinted P3HT solar cells. After carefully optimizing the nanostructure geometry, they achieved an efficiency of 3-4%, which is not as high as the efficiency record (over 4%) other groups have achieved with this polymer. In the new study, they extended their technique to low bandgap polymer solar cells and realized a high efficiency up to 5.5%, which is among the best efficiencies for this polymer reported in the literature. This result indicates that nanoimprint fabrication works better for low bandgap polymer solar cells. In the new work, the team demonstrates the feasibility of using nanoimprint lithography to make efficient low bandgap polymer solar cells with well-ordered heterojunction. They fabricate high-quality low bandgap conjugated polymer (PCPDTBT) nanogratings using this technique for the first time. "We found that NIL makes PCPDTBT chains interact more strongly and form an improved structural ordering," says Yang. 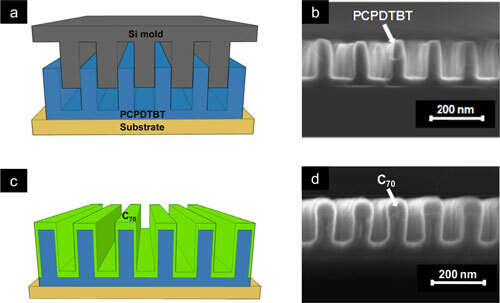 "Solar cells made with the highest aspect ratio PCPDTBT nanostructures show a high power conversion efficiency of 5.5%. They are the most efficient nanoimprinted polymer solar cells, as well as the best reported solar cells using the same material." Nanoimprint lithography has emerged as an effective fabrication technique to precisely define the nanomorphology in polymer solar cells. Controlled chain ordering as well as a bicontinuous and interdigitized heterojunction can be achieved by imprinting conjugated polymers, where a nanoimprint induced chain alignment is present, followed by infiltrating fullerene into patterned polymer nanostructures. However, as Yang notes, most studies so far have focused on nanoimprinted P3HT/fullerene solar cells. "This material combination is not ideal due to a mismatch between the absorption of P3HT and solar spectrum, which has a maximum photon flux at 1.6-1.8 eV while P3HT has a relatively large bandgap of 1.9-2.0 eV," he explains. "A bandgap of 1.3-1.5 eV is considered to be ideal for polymer-fullerene solar cells." In recent years, many low bandgap polymers have been synthesized with record-breaking efficiencies. However, as Yang points out, it has been proven that the donor and acceptor phase separation for these polymers cannot be realized by thermal or solvent vapor annealing, which is usually carried out on P3HT/fullerene solar cells. Although additives such as 1,8-octanedithiol are added into the solution to help separate donor and acceptor domains, this separation cannot be controlled precisely. Therefore, NIL would provide an effective solution if an ordered active layer morphology could be formed by it. However, so far no results have been published that show that NIL can be applied to a wide variety of materials in the polymer solar cell field. Now, the UT Dallas team has utilized NIL to pattern the low bandgap (1.4 eV) solar cell polymer PCPDTBT. For the first time, they have used NIL to fabricate high quality nanogratings for this polymer. "After carefully optimizing the nanograting geometry, we were able to achieve a high solar cell efficiency of 5.5%," notes Yang. Furthermore, this work demonstrates that NIL is not only limited to solar cells made of the most widely studied polymer P3HT, but also can be applied to a wide variety of materials used in the fabrication of polymer solar cells – low bandgap polymers can also be patterned by this technique to make efficient devices. Despite considerable effort, the highest reported power conversion efficiencies obtained from nanoimprinted P3HT solar cells have been in the 3-4% range. These values are lower than the highest values (∼4-5%) when the same polymer is used in a bulk heterojunction structure. "This indicates that NIL works better for low bandgap polymer solar cells," says Yang. "One possible explanation is that the method of using thermal or solvent vapor annealing to control the phase separation in P3HT based bulk heterojunction solar cells is very effective, as shown by a number of studies; while that of using additives in the low bandgap polymer solar cells is not, as described in literature." "This less effective approach leaves NIL more space to demonstrate its advantage in improving the solar cell performance when compared to the bulk heterojunction structure," he concludes. "This is our preliminary thinking and more studies are required to understand these different behaviors. Also as predicted in our recent study, a larger interface area between polymer and fullerene is preferable for efficient devices. A practical way to further increase it is needed as well. Our future work will focus on these aspects."